Eating seasonably can help you save money, eat healthier, eat a greater variety of foods, and support local farmers. 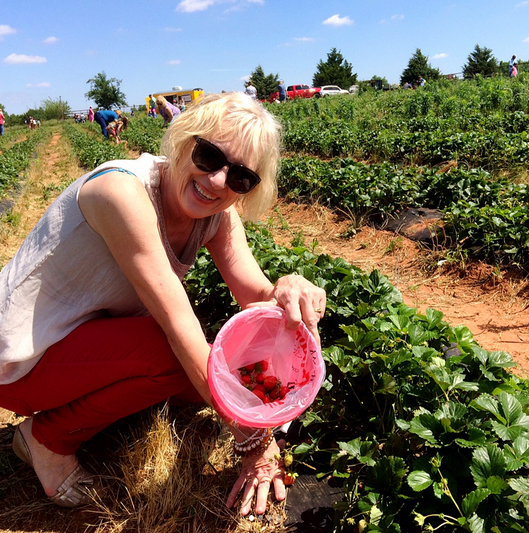 The Oklahoma Food Coop is one way to get delicious, local produce all year long. They describe themselves as "a marketing network of farmers, ranchers, artisans, and customers and volunteers that work together to bring local food and products to your front door." You can order food online from them and pick it up at one of their 52 designated sites. Local farmer's markets are another great resource for seasonal food! And there are also a number of pick-your-own farms in the area, such as the Agape House Berry Farm (seen in the photo) that has strawberries in April and May and blackberries in June and July. Once you've gathered all that tasty produce, try out the Food Network's Top 10 Tips for Excellent Summer Grilling! Staff & faculty enjoyed a presentation on seasonal eating and on the best techniques for building your own mason jar salads.